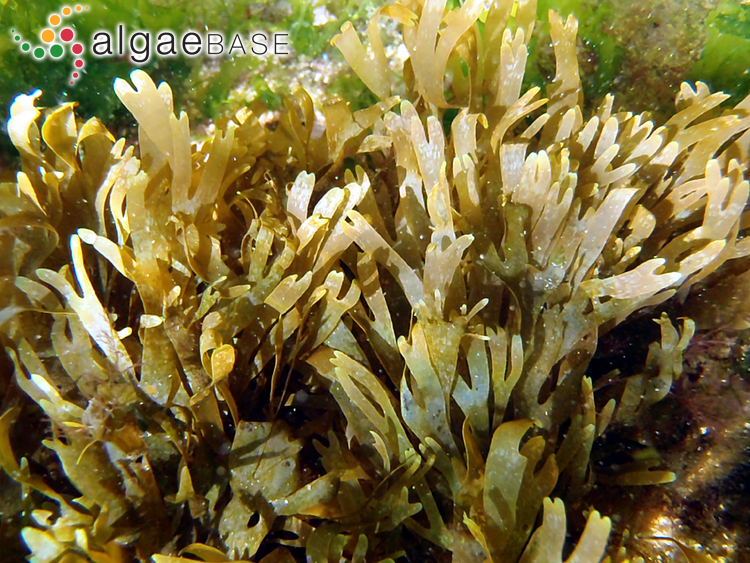 subtidal with Chylocladia verticillata, A Coruña, Galicia, Spain, 2015. Ignacio Bárbara. © Ignacio Bárbara (barbara@udc.es). 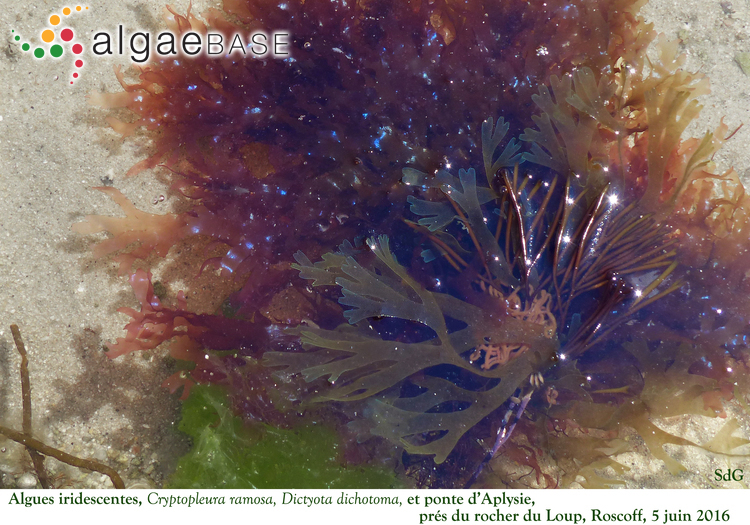 iridescent algae, prés du rocher du Loup, Roscoff, France. 05 Jun 2016. S. Loiseaux-de Goër. © S. Loiseaux-de Goër. Cabo de Palos, Murcia, Spain. 10 Aug 2014. Isabel Rubio Perez " . © marmenormarmayor.es. 1. Habit. 2. Branching pattern. 3. 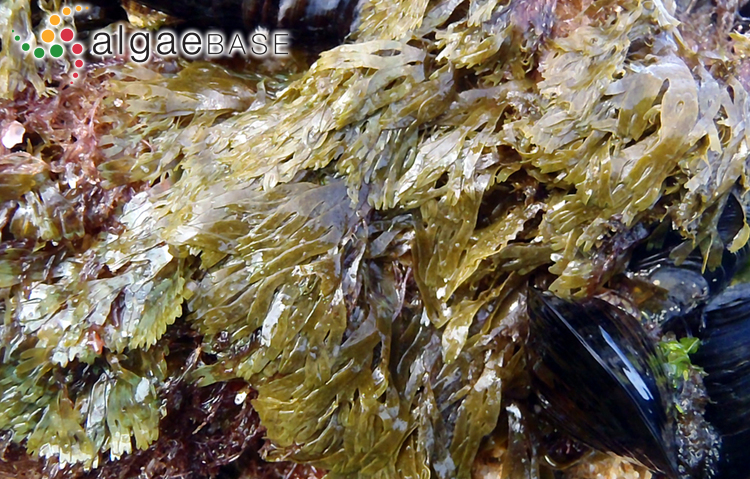 Low intertidal (Nhatrang Bay, Vietnam).. 09 Mar 2012. Eduard and Tamara Titlyanova. © Eduard and Tamara Titlyanova (etitlyanov@mail.ru). South of Portugal, 2010. 24 Oct 2011. Ignacio Bárbara. © Ignacio Bárbara (barbara@udc.es). Published in: Lamouroux, J.V.F. (1809). Exposition des caractères du genre Dictyota, et tableau des espèces qu'il renferem. Journal de Botanique [Desvaux] 2: 38-44. This is the type species (holotype) of the genus Dictyota. Type locality: Walney Island, Lancashire, England (Silva, Basson & Moe 1996: 589). Notes: According to Womersley (1987: 194), the type is from England: probably lost. According to De Clerck (2003), a neotype needs to be selected. John et al. (2004) cite Dictyota implexa (Desfont.) J.V. Lamour, D. linearis (C. Agardh) Grev. and D. volubilis Kütz. as synonyms of this species. South & Skelton (2003) note that Fijian records of Dictyota require a thorough revision comparable with that made for Indian Ocean species by de Clerck (1999). De Clerck (2003) notes that this species is reported from all around the world but is possibly restricted to the north-east Atlantic Ocean and Mediterranean Sea. Tsuda (2004: 50) notes that Schnetter et al (1987), Hornig & Schnetter (1988) and De Clerck & Coppejans (1997) follow the premise that D. dichotoma is restricted to the North Atlantic; therefore , the Pacific species cited as D. dichotoma and D. apiculata should bear another name. English: Divided Net Weed, Brown Fan Weed (Bunker et al. 2010). German: Gemeine Gabelzunge (Braune 2008). Dawson, E.Y. (1950). Notes on some Pacific Mexican Dictyotaceae.. Bulletin of the Torrey Botanical Club 77: 83-93, 3 figs. Tronholm, A., Steen, F., Tyberghein, L., Leliaert, F. Verbruggen, H., Siguan, M.A.R. & De Clerck, O. (2010). Species delimitation, taxonomy, and biogeography of Dictyota in Europe (Dictyotales, Phaeophyceae). Journal of Phycology 46(6): 1301-1321. Tsuda, R.T. (2004). 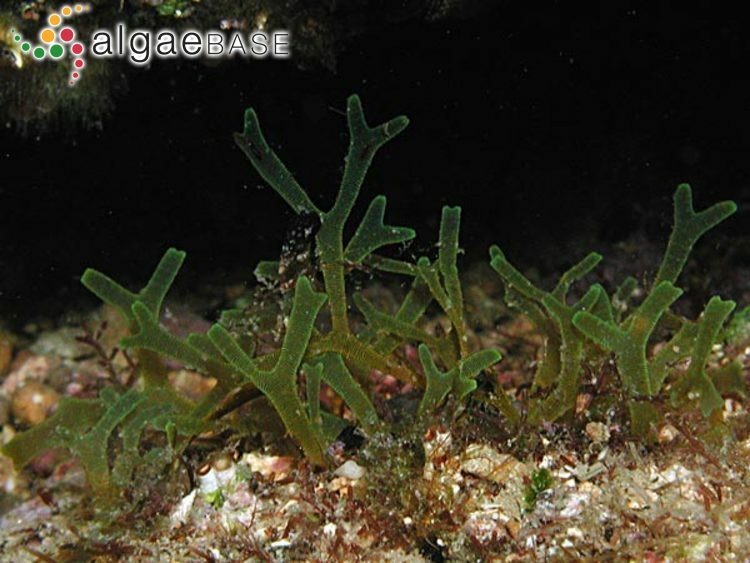 Dictyota (Phaeophyceae) from Micronesia. 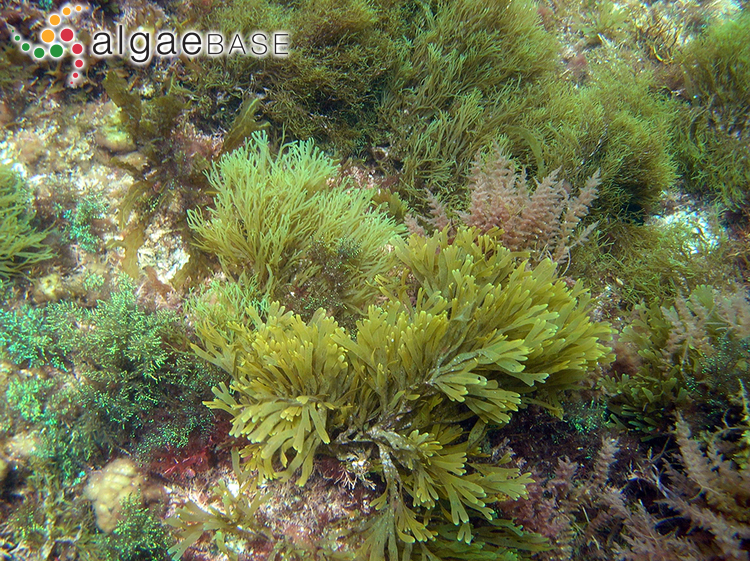 In: Taxonomy of Economic Seaweeds with reference to the Pacific and other locations. (Abbott, I.A. & McDermid, K.J. Eds) Vol.9, pp. 41-56. Accesses: This record has been accessed by users 80467 times since it was created. Ahmad, V.U., Bano, S., Shaikh, W., Uddin, S. & Shameel, M. (1990). Isolation and structure determination of 1,1,6,6-tetrachloro, 3,4-diphenyl hexane from brown alga Dictyota dichotoma. Pakistan Journal of Scientific and Industrial Research 33: 428-430, 1 fig, 6 tables. Du Rietz, G.E. (1918). Dictyota dichotoma (Huds.) Lamour. från skäret Bonden utanför Gullmarsfjordens mynning i Bohuslän. Svensk Botaisk Tidsskrift 12: 487. Feldmann, G. & Gugliemi, G. (1972). Les physodes et les corps irisants du Dictyota dichotoma (Hudson) Lamouroux. Compte Rendu Hebdomadaire des Séances de l’Académie des Sciences. Paris. Série D 275: 751-754. Flores-Moya, A., Hanelt, D., Figueroa, F.L., Altamirano, Mª, Viñegla, B. & Salles, S. (1999). 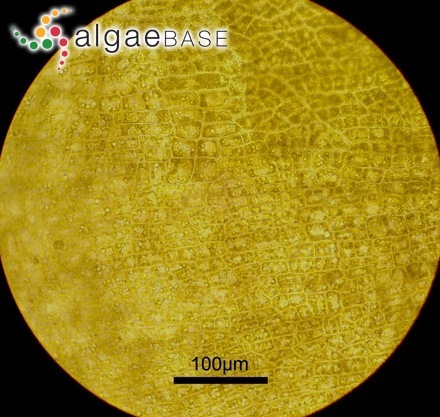 Involvement of solar UV-B radiation in recovery of inhibited photosynthesis in the brown alga Dictyota dichotoma (Hudson) Lamouroux. J. Photochem. Photobiol. B: Biol. 49: 129-135. Gaillard, J. & L'Hardy-Halos, M.-T. (1976). Corrélations morphogènes et comportement des deux initiales filles chez le Dictyota dichotoma (Huds.) Lamouroux (Dictyotales-Phéophycée). Compte Rendu Hebdomadaire des Séances de l’Académie des Sciences. Paris. Série D 282: 2167-2170. Gaillard, J. & L'Hardy-Halos, M.-T. (1977). A propos de la morphogenèse du Dictyota dichotoma (Huds.) Lamouroux (Phéophycée, Dictyotale; phénomènes corrélatifs mis en évidence sur les tronçons apicaux isolés expérimentalement. Revue Algologique, Nouvelle Serie 12: 101-110. Gaillard, J. & L'Hardy-Halos, M.-T. (1979). Corrélations de croissance chez le Dictyota dichotoma (Huds.) Lamouroux (Phóphycée, Dictyotale); contrôles mutuels de l'apex et la base du thalle au cours du développement des gamétophytes juvéniles. Revue Algologique, Nouvelle Serie 14: 149-162. Gaillard, J. & L'Hardy-Halos, M.-T. (1980). Croissance et ramification chez le Dictyota dichotoma (Hudson) Lamouroux (Phéophycée, Dictyotale). Phycologia 19: 159-167. Gaillard, J. & L'Hardy-Halos, M.-T. (1990). 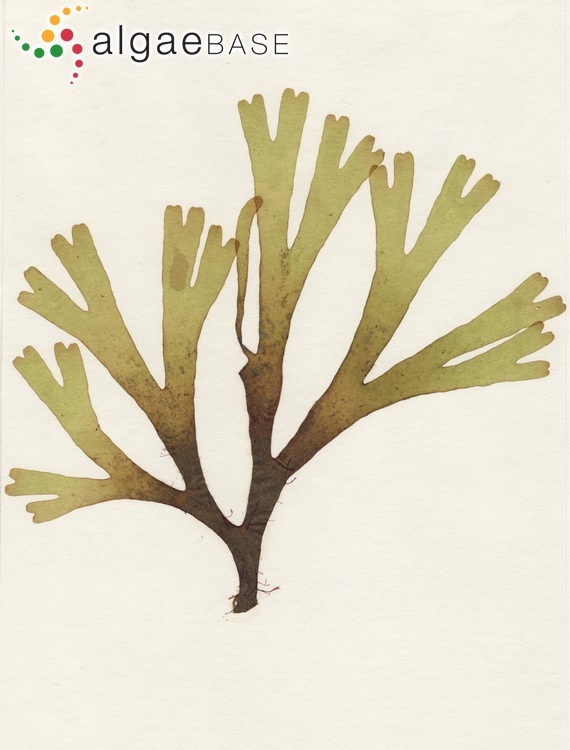 Morphogenèse du Dictyota dichotoma (Dictyotales, Phaeophyta). III. Ontogenèse et croissance des frondes adventives. Phycologia 29: 39-53, 39 figs, 7 tables. Gaillard, J. (1972). L'iridescence chez deux Dictyotales, Dictyota dichotoma (Huds.) Lamouroux et Zonaria tournefortii (Lamour.) Montagne. 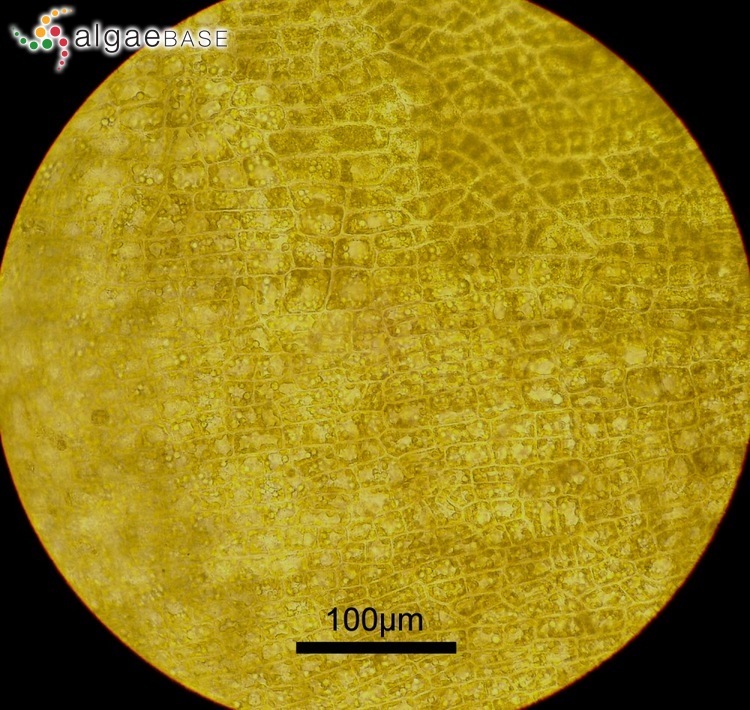 Cytologie des cellules iridescentes. Botaniste 55: 71-79. Gaillard, J., L'Hardy-Halos, M.T. & Pellegrini, L. (1986). Morphogenèse du Dictyota dichotoma (Huds.) Lamouroux (Phaeophyta. II. Ontogenèse du thalle et cytologie ultrastructurale de différents types de cellules. Phycologia 25: 340-357. Hanelt, D., Uhrmacher, S. & Nultsch, W. (1995). The effect of photoinhibition on photosynthetic Oxygen production in the brown alga Dictyota dichotoma. Botanica Acta 108: 99-105. Holden, H.S. (1913). On some abnormal specimens of Dictyota dichotoma. Memoirs and Proceedings of the Manchester Literary and Philosophical Society 57 (No. 9)(II): 1-6. Hwang, I.K., Kim, H.-S. & Lee, W.J. (2005). 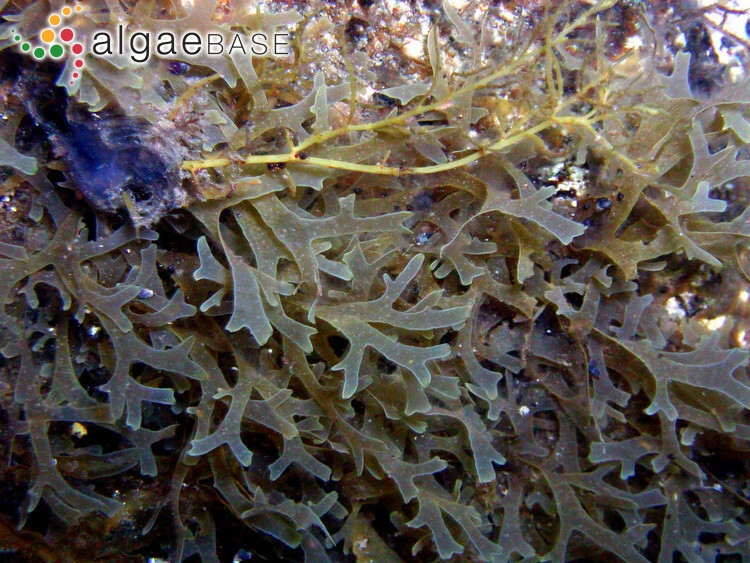 Polymorphism in the brown alga Dictyota dichotoma (Dictyotales, Phaeophyceae) from Korea. Marine Biology, Berlin 147: 999-1015. Höring, I. & Schnetter, R. (1988). Notes on Dictyota dichotoma, D. menstrualis, D. indica and D. pulchella spec. nova (Phaeophyta). Phyton 28: 277-291. Hörnig, I. & Schnetter, R. (1988). Notes on Dictyota dichotoma, D. menstrualis, D. indica and D. pulchella spec. nova (Phaeophyta). Phyton (Horn) 28: 277-291. Katsaros, C. & Galatis, B. (1985). Ultrastructural studies on thallus development in Dictyota dichotoma (Phaeophyta, Dictyotales). British Phycological Journal 20: 263-276, 21 figs. Lund, S. (1940). Om Dictyota dichotoma (Huds.) Lamour. og andre nye arter for floraen i Nissum Bredning. Botanisk Tidsskrift 45: 180-194. Mimuro, M., Katoh, T. & Kawai, H. (1990). Spatial arrangement of pigments and their interaction in the fucoxanthin-chlorophyll a/c protein assembly (FCPA) isolated from the brown alga Dictyota dichotoma. Analysis by means of polarized spectroscopy. Biochimica et Biophysica Acta 1015: 450-456. Müller, D.G., Gassmann, G., Boland, W., Marner, F. & Jaenicke, L. (1981). 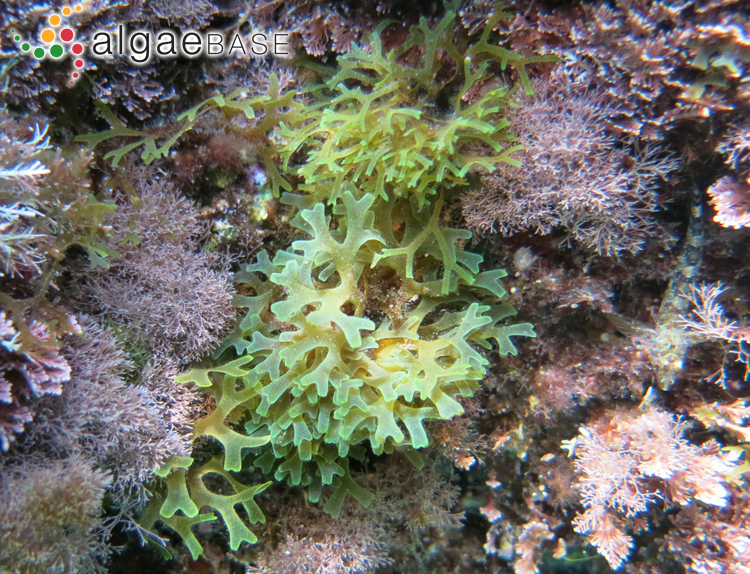 Dictyota dichotoma (Phaeophyceae): identification of the sperm attractant. Science 212: 1040-1041. Müller, S. & Clauss, H. (1976). 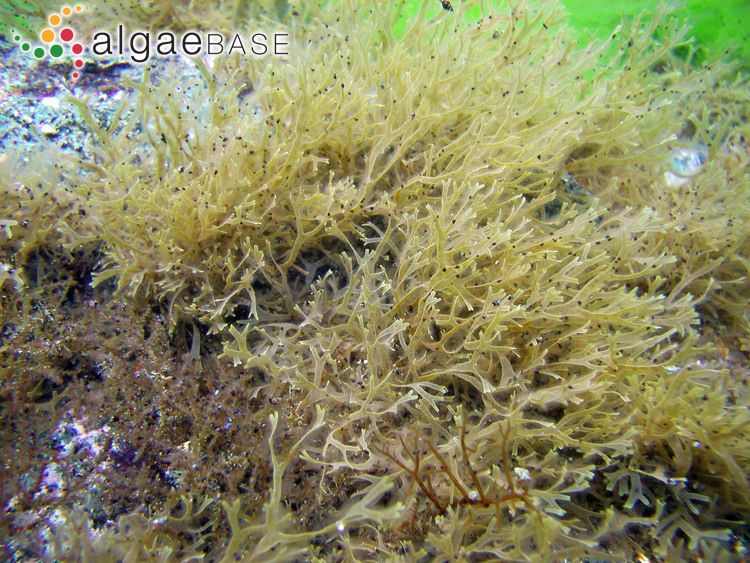 Aspects of photomorphogenesis in the brown alga Dictyota dichotoma. Zeit. Pflanzenphysiol. 78: 461-465. Nultsch, W., Pfau, J. & Materna-Weide, M. (1987). Fluence and wavelength dependence of photoinhibition in the brown alga Dictyota dichotoma. Marine Ecology Progress Series 41: 93-97. Nultsch, W., Rüffer, U. & Pfau, J. (1984). Circadian rhythms in the chromatophore movements of Dictyota dichotoma. Marine Biology, Berlin 81: 217-222. Pybus, C. (1974). Some observations on the behaviour of excised segments from Dictyota dichotoma (Huds.) Lamour. and Dilophus spiralis (Mont.) Hamel in culture. Irish Naturalists' Journal 18: 25-27. Richardson, J.P. (1979). Overwintering of Dictyota dichotoma (Phaeophyceae) near its northern distribution limit on the east coast of North America. Journal of Phycology 15: 22-26. Rull Lluch, J., Ribera, M.A., Barceló, M.C. & Gómez Garreta, A. (2005). Mapas de distribución de algas marinas de la Península Ibérica e Islas Baleares. XVIII. Dictyota dichotoma, D. linearis y D. mediterranea (Dictyotales, Fucophyceae) . Botanica Complutensis 29: 63-70. Russell, G. (1970). Rhizoid production in excised Dictyota dichotoma. British Phycological Journal 5: 243-245. Teixeira, V.L., Da Silva Almeida, S.A. & Kelecom, A. (1990). 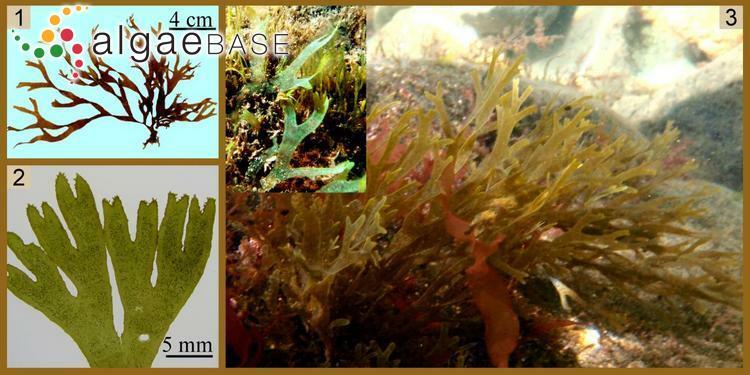 Chemosystematic and biogeographic studies of the diterpenes from the marine brown alga Dictyota dichotoma. Biochemical Systematics and Ecology 18: 87-92. Tronholm, A., Sansón, M., Afonso-Carrillo, J. & De Clerck, O. (2008). Distinctive morphological features, file-cycle phases and seasonal variations in subtropical populations of Dictyota dichotoma (Dictyotales, Phaeophyceae). Botanica Marina 51: 132-144.